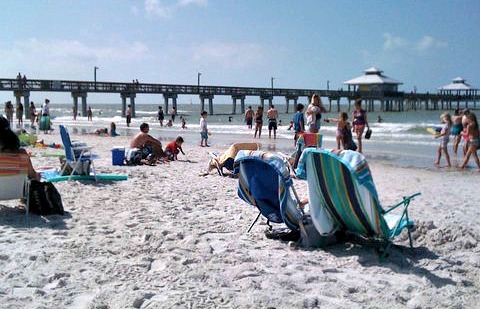 Fort Myers Beach - White sugar sand, aquamarine waters, beautiful resorts, and great shopping and dining all make for the best Florida beach vacations! 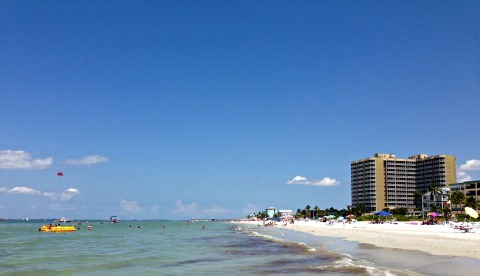 Ft Myers Beach is on Estero Island, a barrier island in the Gulf of Mexico. 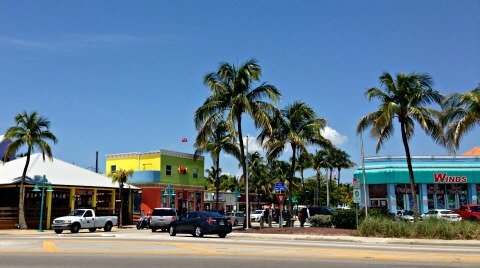 Although it's part of the Ft Myers- Cape Coral Metropolitan area, the island is separate from Ft Myers and has it's own government. 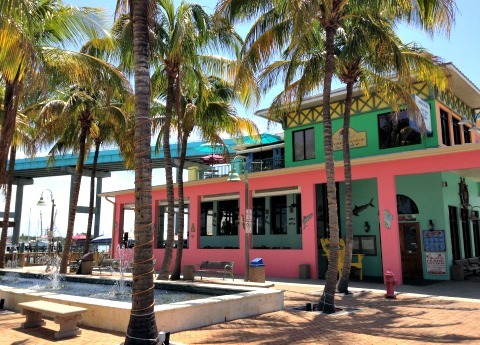 Even though it's only 7 miles long, you will find Ft Myers Beach packed with so many things to do and beaches from one end of the island to the other. 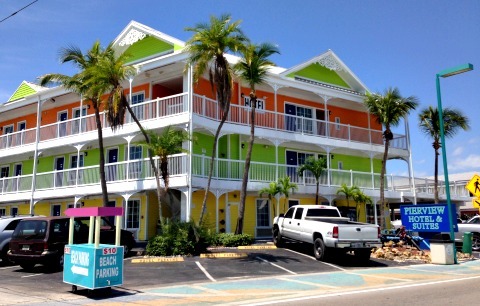 You have many choices of accommodations at many price points ......... hotels, resorts, motels, bed and breakfasts, villas, inns, RV parks and resorts, and rentals of all kinds and sizes. Popular with families, honeymooners, and spring breakers alike, you can enjoy everything from kayaking, parasailing, boating, fishing, all kinds of watersports along with nature, history, nightlife, and relaxing, of course! 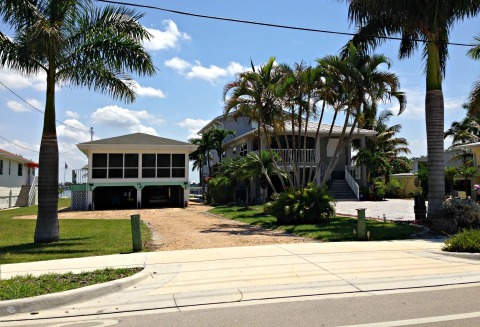 As you come onto the island from the Matanzas Pass Bridge, you can turn right onto Estero Blvd and within one block arrive at the heart of "downtown" Fort Myers Beach. At this intersection, Time Square is on your left ....... and has shops, eating spots, the beach, and beach parking. This part of the beach is usually packed, is where most of the action is, and also has the pier. Paying for beach parking is easy. In the city lots pay stations accept cash or credit, and you pay $2/hour. Private lots charge $6-$10 for the day. That price changes depending on when you arrive, what day it is, and what else might be happening on the beach that day. To the right is more parking, shopping, dining, and various accommodations on Old San Carlos Blvd. 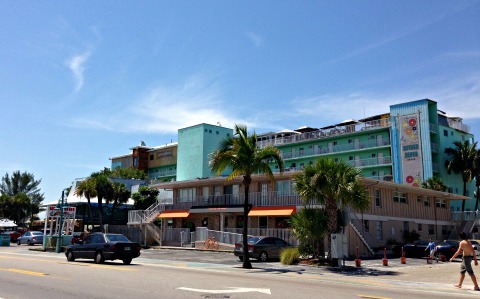 As you continue down Estero Blvd to the north you'll see hotels and apartments mixed in with guest houses lining the gulfside of the beach on the left and vacation homes on the bayside on the right. 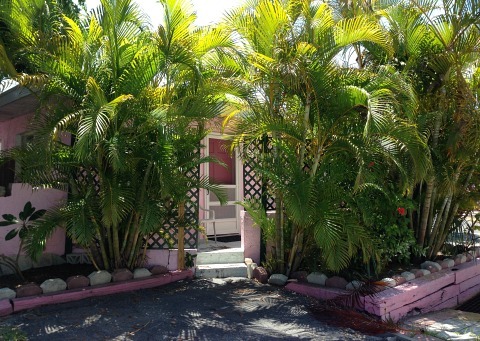 Drive for about a mile and just past The Pink Shell Resort, Estero Blvd deadends at Bowditch Point Beach on the northern end, where you'll find a less crowded beach. Turn around and head back to the southern end of the beach, past Time Square and the bridge. 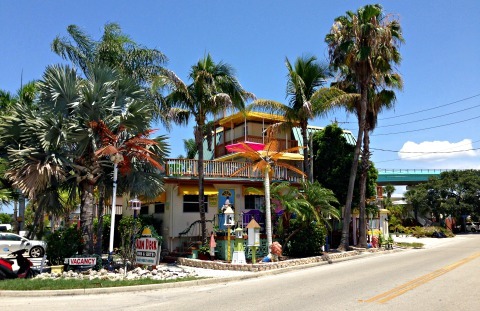 Keep going and you'll pass many shops and restaurants .... including the Lani Kai, the famous green hotel popular with spring-breakers. 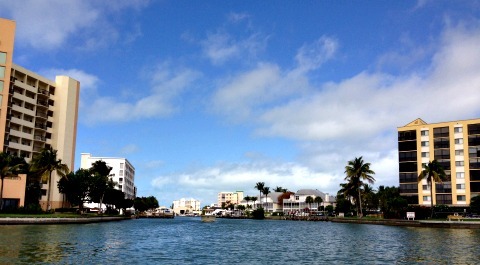 As you drive south, this part of the island widens and there are many side lanes off the boulevard with houses and apartments on and off canals on the bayside of the boulevard. 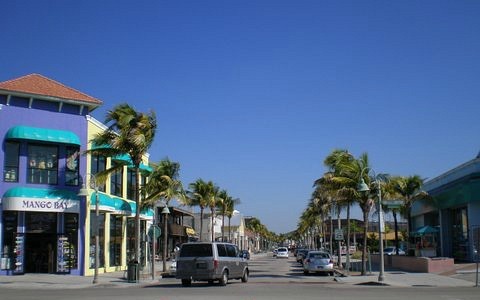 On the bayside of Estero Blvd, vacation homes are mixed in with more shops, restaurants, and various businesses. 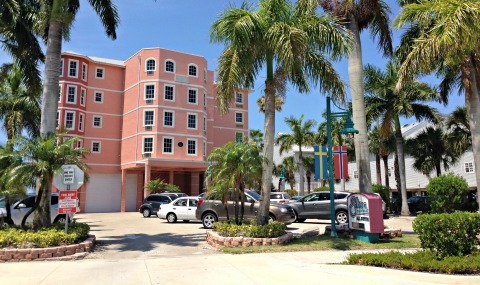 Hotels, resorts, and apartments line the gulfside of the boulevard. You'll also see beach entrances with a few parking spots every couple of blocks or so. These beaches are a bit less crowded for the most part compared to the Time Square area. 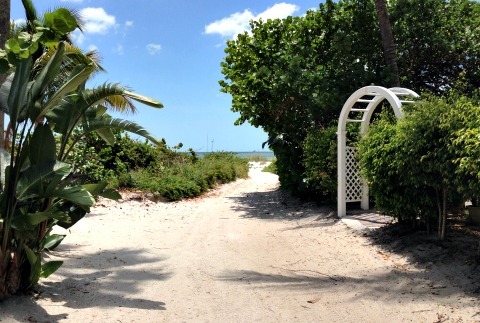 At the southern end, you drive over a bridge to the even less crowded and non-commercial beaches of Lovers Key, along with a boat launch. There's also a dog beach on Long Key south of Lovers Key where dogs can run free off the leash. 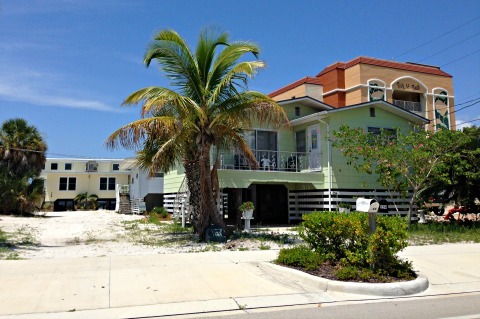 Past that is Bonita Springs and more beautiful beaches! By the way, you can bring dogs to any of the Fort Myers Beaches except for Bowditch Point, but they must be on a leash. Make sure you clean up after your pet. 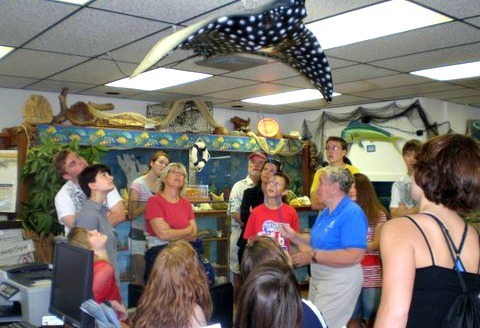 As for things to do in Fort Myers Beach, just before the bridge onto the island, you can learn about marine life at Ostego Bay Marine Science Center. 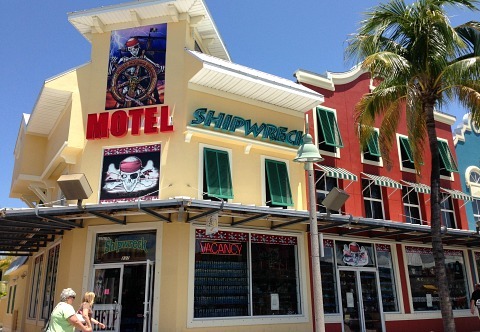 Or, catch the Key West Express for a day or overnight in Key West, or buy fresh shrimp right off the boat at Trico Shrimp ...... all on San Carlos Island, before the bridge. A bit further down at Salty Sam's Marina, you can take your kids for a swashbuckling ride on the Pieces of Eight Pirate Boat! 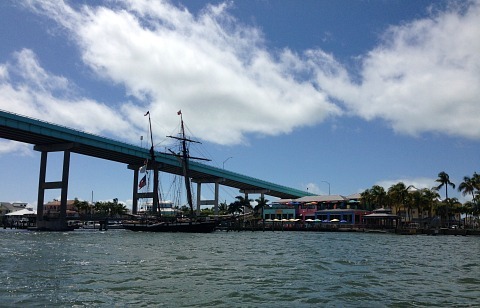 At the end of Old San Carlos Blvd over by Nervous Nellie's Restaurant, you can catch a ride on the Ft Myers Princess to go on dolphin, eco, sightseeing, or sunset tours. 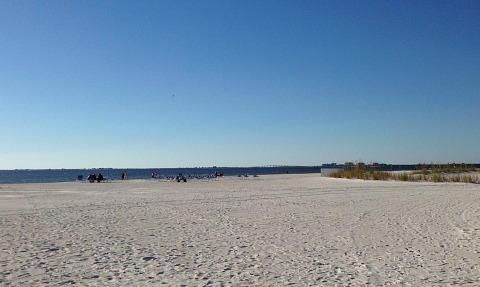 There's a certain charm to Fort Myers Beach. 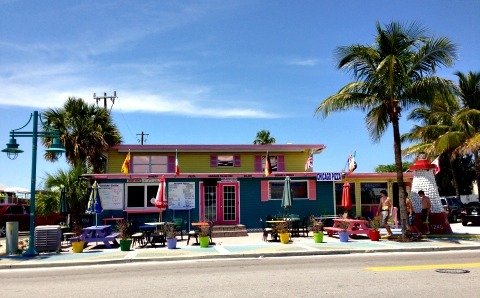 I love the mixture of bright colors and pastels, old and new, luxury and beach kitsch. It's fun to go exploring ...... this neighborhood is under the bridge where you'll find private homes and vacation accommodations. Learn how to sail, go paddleboarding, or set your sights high by going parasailing. Go fishing! 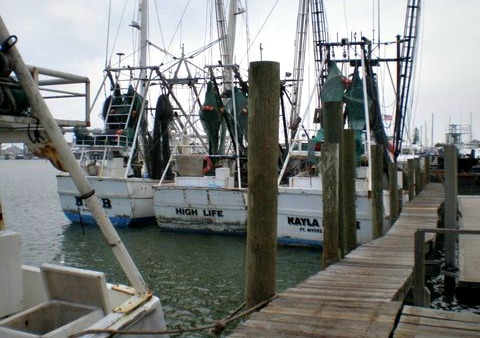 Flats or inshore, offshore, or deep sea, get more information by going to my Fishing page. Play golf at the Fort Myers Beach Club, walk through the mangroves at Matanzas Pass Preserve. Go to my Heavenly Biscuit page to photos of the mangroves! Take a tour of an ancient Calusa shell mound at the Mound House. Learn about these native Americans ........ and bring a picnic along! Take a tour to explore the island of Mound Key - believed to be the ceremonial center of the Calusas - where you'll see shell mounds and interpretive displays. Watch movies at the Beach Theater. If you're on vacation and you don't have a rental car, you can get to all these places on the Trolley, click here for the Trolley Schedule. It you're there in November, go to the Sand Sculpture Festival! The sculptures are amazing and it's a lot of fun. 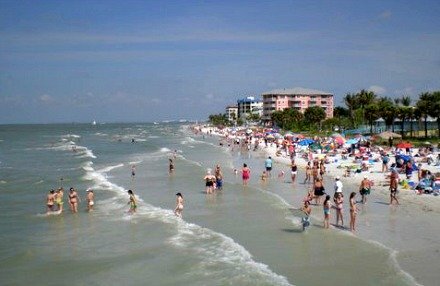 And, Fort Myers Beach is one of my most favorite places to watch July 4th fireworks ....... you can see the fireworks on Sanibel and Cape Coral too! 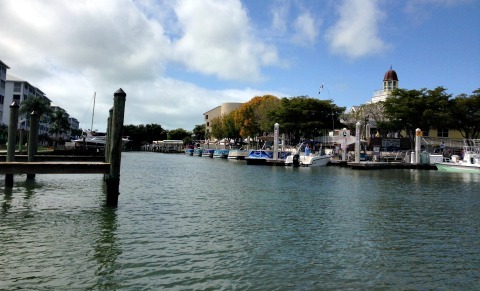 Come by boat, there are several marinas: Fish Tale Marina, Snook Bight, Pink Shell Resort, Marina Towers and Yacht Club, Moss Marina, and Snug Harbor Marina. 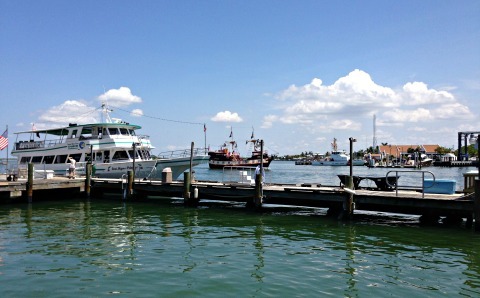 Before you get on the island there are these marinas and docking spots: Salty Sam's, Gulf Marine Ways & Supplies, Boat Club of Sanibel, Bonita Bills Waterfront Cafe, Marina Mike's, Getaway Marina, and Mariner's Lodge and Marina. 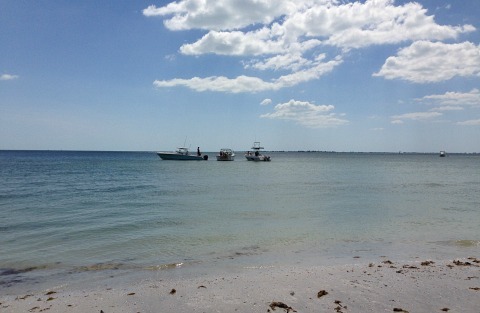 Of course, you can always just park your boat offshore all along the beach, particularly in front of the Lani Kai, drop anchor and hang out with other boaters ..... party time! 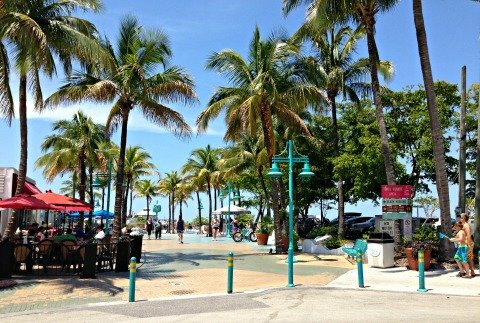 To explore more of Southwest Florida within a 30-40 minute drive are all that Sanibel, Captiva, Ft Myers, Bonita Springs, Estero, Naples, and Cape Coral have to offer!